Finally, just like every other modern game, Limit Theory now has highly-exaggerated ambient occlusion. At least mine isn't screen-space, though. A while back I dropped SSAO because I was tired of it. It's expensive, requires absurd levels of tweakery just to get right, varies with distance to the object, etc. It's bad, let's face it. Per-vertex AO probably isn't an option for many games due to tessellation level on the mesh. For per-vertex to work, you need a consistent level of tessellation across the whole surface. Hey, guess which really stupid method of creating surfaces provides just that? Yep, uniform-grid contouring of distance fields. Marching cubes, Dual Contouring, you name it. I used to think that the uniform level of tessellation, even on really flat surfaces, was a big problem. Now I realize that we can actually use it to our advantage by storing useful information at the vertex level! I love this kind of occlusion, because, unlike SSAO, it does not vary with distance. 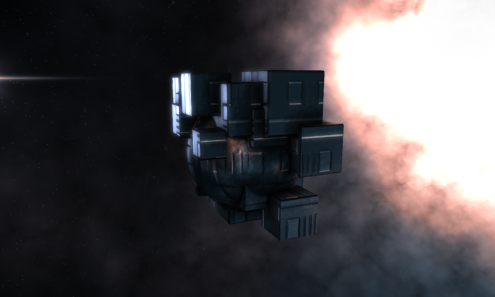 So you can zoom in as far as you like, and those darkly-shaded corners are still dark (a result that is impossible with screen-space ambient occlusion techniques). Note that I exaggerated it a lot for this shot, it probably won't be that heavy in the game! Anyway, I'm very excited about using this in LT. I can't wait to see how good ships will look once I get the ship generator converted to use scalar fields rather than polygons!!! PS ~ You might be concerned about performance given the high tessellation of surfaces because of the large number of vertices that methods like MC and DC output. Indeed, at first it seems like a valid concern. But then again, vertices are extremely cheap these days. Vertex shaders are significantly lighter than fragment shaders, and also get run significantly less frequently. This means that in almost every modern game, you will find yourself very much bottlenecked by the fragment shader. Furthermore, with field methods, you get perfect LOD meshes for free, you just turn down the contouring resolution. So even if you're putting more vertices on screen, you can easily control this by setting up LOD levels. With analytic normals, even low-resolution meshes tend to look quite good! So I don't think vertex density is something to be too worried about.